Starting in Chrome 71, Google will warn Chrome users when they are visiting pages that use deceptive forms to sign visitors up for mobile subscriptions. Deceptive sites are asking users to enter their mobile information in order to access a game or other content. When a user enters their mobile information, they gain access to the promoted content but without their knowledge, they are also being signed up for a mobile subscription. For example, in the below form a user is asked to enter their mobile number, but unless they read the really fine print, they won't know that they are actually signing up for a paid subscription. To combat this, Google is adding a new Billing category to Safe Browsing that keeps track of sites that perform deceptive billing signups. 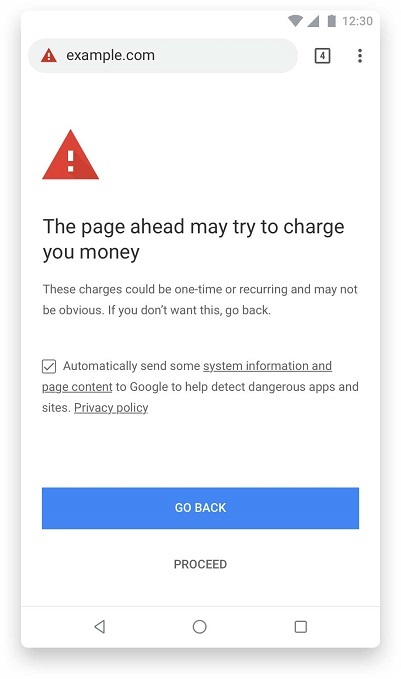 When Chrome mobile, desktop, and Android WebView users visit a page that has been flagged as deceptive, they will be shown a warning interstitial that states "The page ahead may try to charge you money." Like other Safe Browsing warnings, it will then give you the option to proceed to the site or go back to the previous site that you were at. For webmasters who are concerned their sites may be flagged under this new Safe Browsing category, Google has released new mobile billing charges best practices that webmasters should follow. According to Google's announcement, web pages must answer positively to the following questions to not be flagged as deceptive. • Is the billing information visible and obvious to users? For example, adding no subscription information on the subscription page or hiding the information is a bad start because users should have access to the information when agreeing to subscribe. • Can customers easily see the costs they’re going to incur before accepting the terms? For example, displaying the billing information in grey characters over a grey background, therefore making it less readable, is not considered a good user practice. • Is the fee structure easily understandable? For example, the formula presented to explain how the cost of the service will be determined should be as simple and straightforward as possible. If Google detects a deceptive page, it will alert the webmaster through the Google Search Console. Webmasters can then resolve any issues and submit an appeal to remove the flag from their page.